On Friday 12th July the rather lovely Sue and Graham tied the knot at the seaside location of Whitstable Castle in Kent. We sang as all their wedding guests arrived and were seated ready for the ceremony. They chose some beautiful songs for us to entertain everyone with and as they are rather fond of James Bond a few of those featured too! The wedding ceremony was delightful and full of emotion. Afterwards the newlyweds and all their guests transferred outside to the grounds of the castle to celebrate with champagne in the sunshine! We sang whilst they had their photos taken and enjoyed everyone making a big fuss of them. We even had guests dancing out on the lawn which was brilliant! We wish the mew Mr and Mrs Flynn and wonderful future together. You are made for each other! "Just a note to say a big thank you for yesterday, you were absolutely superb and helped make our day special and memorable. There were so many comments about you and your lovely singing that created such a wonderful atmosphere in the castle and grounds. Many thanks." Mr & Mrs Flynn. 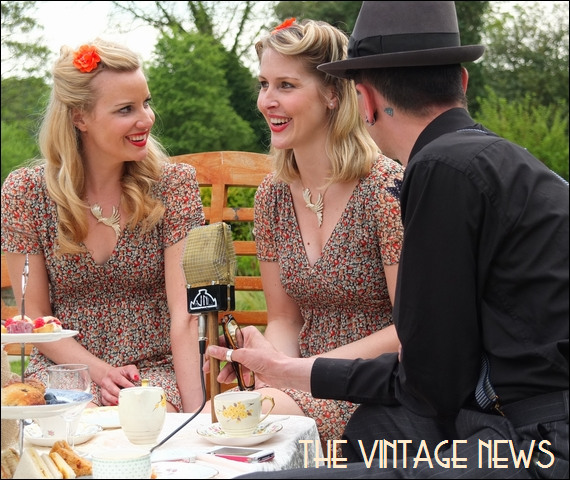 On June 29th we donned our victory rolls and disappeared back to the 1940's to sing at RHS Wisley's Vintage Garden Party. RHS Wisley is an absolutely beautiful garden nestled in leafy Surrey, both of us are keen gardener's so were in heaven! We were singing outside next to a gorgeous pop up tea room and some stunning vintage cars supplied by Brooklands Museum. We performed three sets during the day of our favourite vintage style music. It was so relaxed, couple, friends & families put down their picnic blankets, popped open their wine and ate their picnics as we entertained them. We even had a couple of jiver's who joined us dancing later in the day! We absolutely loved the day and look forward to returning to RHS Wisley for future events! A special thanks to the fab guys who let us jump in their cars and have our photos taken! If you are holding a vintage event get in touch! On Saturday 15th June we were booked to sing at Amanda's 50th birthday party. From the moment we spoke to Amanda we knew this was going to be a really fun evening! The guests were all told to dress up in sixties gear for the party in Liphook, Surrey and boy did they dress up!!!! We also loved the opportunity to go beehive mad!!! 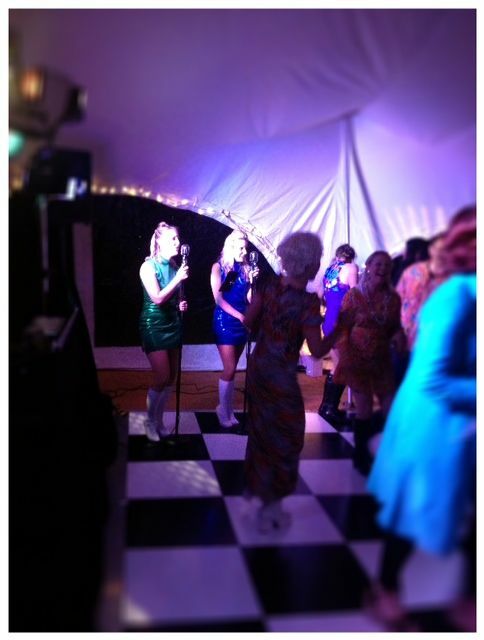 We performed a 60's dance set and during it taught all the guests a party dance (which Amanda asked for!) to Twistin' the Night Away. We have never seen so many twisting ladies and gents in all our time!! We had a brilliant evening and left them all the party into the night!! If you are having a party get in touch- we offer 50's, 60's, 70's & 80's dance sets including a party dance! "Thank you so much for your 60's set you did at my party- you looked and sounded fabulous and really got the party going! I loved the dance routine you put together and everyone loved doing the moves; it was better than I dared hope. I only wish it had been longer! " Amanda Gallagher. 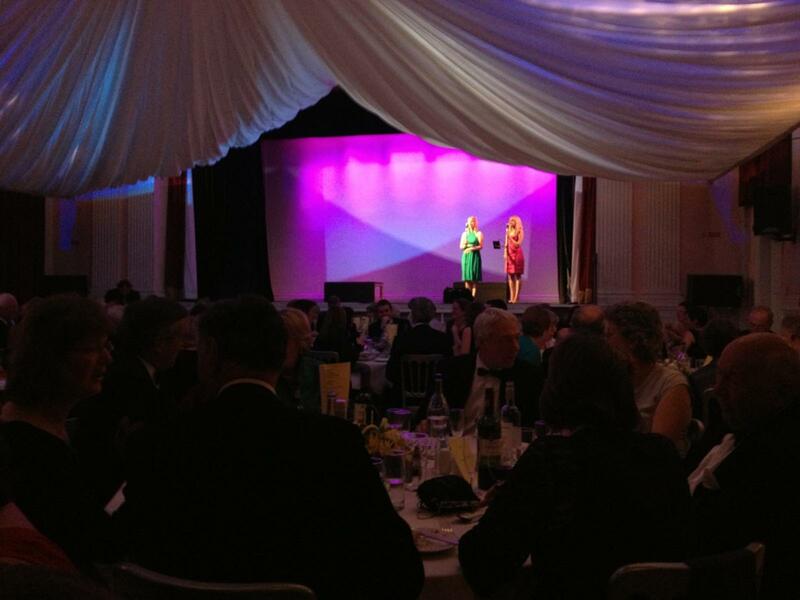 On Saturday 25th May we were booked to sing at Haslmere Hall's Centenary Gala Dinner. Haslemere Hall is nestled in the Surrey Hills and is a hive of local activity most days and nights for everything from the local Bridge Club to musical theatre classes for children to packed cinema screenings. The evening began with the popping of champagne corks to start the celebrations off which was quickly followed by a performance from the immensely talented children of Theatremonkeys (a fabulous theatre school based at Haslemere Hall) performing a song from "Matilda". After a speech from the local Sheriff the guests began their 3 course dinner which was accompanied by us girls singing some easy listening jazz tunes to entertain everyone all night. After much dancing and merriment a few hours later we drew the fantastic evening to a close. We would like to wish Haslemere Hall many congratulations...here's to the next 100 years!
" I have only heard praise for your performance on Saturday night. You both looked stunning and your sound quality was excellent. Your choice of music was exactly right for the occasion and we were very pleased that the volume was loud enough to be heard but not so loud that conversation was blocked. It seems to me to be the perfect act for private dinners, weddings and other occasions where professionalism and subtlety are required. Byfleet Manor are making these Afternoon Tea Events a monthly occasion during the summer months so come and join us on 23rd June for more vintage fun!